Frank Sinatra as Danny Ocean in Ocean’s Eleven (1960). He may be in the middle of the fallout of a major multi-casino heist in Las Vegas, but Sinatra knows when he needs to slow things down a bit. For some relaxation around his hotel room, he takes off the coat and tie and slips into a comfortable cardigan, enjoying some cocktails and banter with Dean Martin before the film’s villain-by-default Cesar Romero shows up to announce his havoc-wreaking plans. 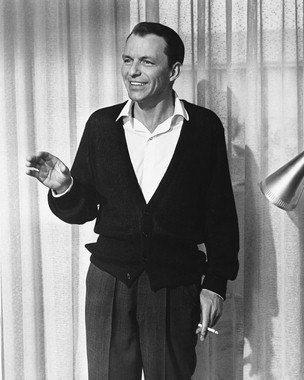 While relaxing, Sinatra sports a cardigan, dress shirt, and suit trousers. The black cardigan is very lightweight, which is probably comfortable against both the Vegas heat and the standard Vegas hotel room air conditioning. Sinatra fastens the top three of the four black buttons, which are suspended in a low stance with the top button somewhere between his solar plexus and his belly button. The cuffs are very elasticized. Paired with the black cardigan are the gray wool trousers from his gray Sy Devore tailored suit, which he wore both at the casino and later at the funeral. In case you’ve forgotten, as I know I have, the trousers have single reverse pleats and plain-hemmed bottoms. They have a high rise, as we can see through the cardigan, and side pockets which Sinatra still uses mostly for his hands. The trousers are worn with a belt, unseen here, but likely the same thin black leather belt with a squared brass clasp as he wears a the funeral. The shirt is a bit more of an enigma. At first, it appears to just be a standard white dress shirt. However, the collar – which is rounded, like a club collar – looks like they it may just be an unfastened tab collar. You may recall that Sinatra later wears a tab-collared dress shirt with French cuffs with the charcoal suit. If this is the same shirt, that means Sinatra is stuffing French cuffs into the tightly-elasticized cuffs of the cardigan, which would be both uncomfortable and unattractive as it would bunch up at the wrists. Since we hardly see the cuffs, I am wondering if this is just a different casual shirt with a rounded spread collar and simple button cuffs. His footwear is all black to match his cardigan, with black leather laced plain-toe derby shoes and thin black dress socks. All in all, a very comfortable – and classy – look. Daniel Craig would later wear his own variation of the black cardigan and slacks look in Quantum of Solace, but with khaki jeans and desert boots rather than suit trousers and leather shoes. Three stages of cool: Frank’s uber-casual, Dean’s blazer and slacks, and Romero’s gray business suit. In the middle of this stressful time of the year, you should take time for yourself. Lock yourself in a room with a drink, a comfortable chair, and a record player (or iPod, if you’re inclined that way). Sinatra’s had some great Christmas albums, but you can hear enough of that on the car radio or in the mall. For some mellow but manly ballads, put Sinatra’s Nice ‘n’ Easy album on. 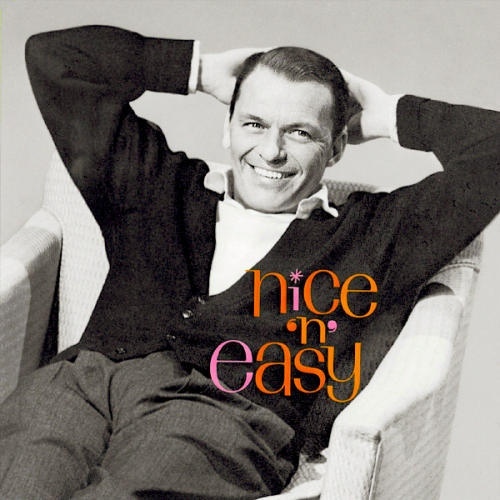 Nice ‘n’ Easy was recorded in the spring of 1960, released a few months later just around the time that Ocean’s Eleven was released in theaters. Eagle-eyed fans would notice that Sinatra’s look on the cover is the exact same cardigan, shirt, and trousers worn in the film, likely a photo snapped while filming this scene. While the film may not have garnered much critical acclaim, the album was well-nominated at the 1960 Grammy Awards, with nominations for Album of the Year, Best Male Vocal Performance, and Best Arrangement, the latter of which is obvious when a conductor like Nelson Riddle is at the helm. The album’s content are the excellent songs from the ’30s from some of the finest American songwriters, including George Gershwin, Irving Berlin, and Johnny Mercer. The entire album, part of Sinatra’s popular and groundbreaking concept series, will put you in the perfect relaxed mood, from the titular leading track to Mercer’s “Dream” at the end. Sinatra dressing down still looks better than most average guys dressing up. Check out the movie . Also, make sure you pick up Sinatra’s Nice ‘n’ Easy album while you’re at it. Rounded collar shirts are a great example of masculine emulation for the sake of classic menfolk’s appearance. The round collar dress shirts appear best on thin or skinny faces. Whereas men with round faces should evade wearing round collar shirts, because the curved lines of round collar prominent the roundness of face. Good point, John. I wonder if Sinatra was aware of this since he, indeed, had a very thin face. Thanks! Rounded collar shirts are a great example of masculine emulation for the sake of classic menfolk’s appearance. The round collar dress shirts appear best on thin or skinny faces.